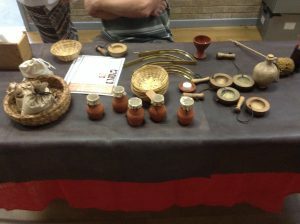 Roman Day was a huge success, the children had a wonderful time exploring all of the activities. This morning we made lots of Roman items including mosaic tiles, perfume bags, Roman medicine, clay pots, and this afternoon we sought out a Roman Spy. We handled artefacts and listened to real experts, who helped us immerse ourselves in the topic and learn lots of new information. We marched like soldiers and made the army formations using spears and shields. The children all looked fantastic and we had a memorable day! A big thank you to all of our helpers today too!